Apollo Aviation Group’s co-founder and President, Robert Korn, has been honoured with the prestigious Juan Trippe award by the Greater Miami Aviation Association (GMAA). 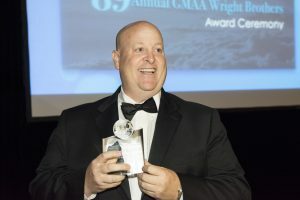 The award was presented by Victor Bontorno, President of the Greater Miami Aviation Association at the 89th Annual GMAA Wright Brothers Memorial Gala on 1 October, 2016. Robert Korn, President of Apollo Aviation Group, awarded Juan Trippe award. The Juan Trippe award is given annually to American aviation executives in recognition of the significant contributions made by an individual to the development of international aviation. Korn has over 24 years’ experience in the aviation industry and in addition to co-founding Apollo Aviation Group, has also held senior positions at global industry leaders Pegasus Aviation and BF Goodrich (formerly Rohr). The award is in remembrance of Juan Trippe who started Pan American World Airways in 1927.